Cozumel & Grand Cayman ideas. Doing a Thanksgiving cruise and stopping at Cozumel and Grand Cayman. Been to GC once and did Sting ray city, this time want to rent a car and explore. Never been to Cozumel. Any ideas for both would be appreciated. Give me an idea of what you might want to do and I will try to help on Cozumel. Ski bum- not sure, but beach snorkel explore. Will be with my 2 kids, 12&13 y.o. And wife. Maybe some shore fishing. Cozumel is an easy island to make a trip around. Rent a Jeep (about $100) and head Southeast to start out. Playa Corona is a nice place to stop, have a beer, and let the kids play around or snorkel. Next are resorts and restaurants along the beach. Many nice spots to stop, visit, trinket shop, and get a bite to eat. After that keep following the loop and see the ocean beaches and rock formations. What ever you do always give yourself time to stop at the last bar before road makes a 90 degree turn to head back to town. Head back and once you get back into town there are several gas stations to fill up the Jeep before you drop it off. Also may want to save a little time for Carlos and Charlies before boarding the ship. If your kids are OK being on the ship by themselves at dock. After failed excursions and finding out that all the snorkel spots are available from the beach we find this the best way to experience the island. Best beach club/snorkeling is Buccanno's. Walk south and drift north. (I have no affiliation with anyone on the island!). Corona Beach Club, right next to Sky Reef both have OK snorkeling. Practically no shore fishing, but I keep trying! Nothing for snorkeling on the east side that is easily accessed, but it is one beautiful beach after the other (depending on the seaweed). Rent a car or a cab (negotiate!) to get you there. The San Gervasio ruins are not impressive and really not worth your limited time. If you go to the east (wild) side bring a cooler filled with beverages and stop at Rasta's, San Martin beach (big palapa on the left, beach on right heading north), Coconut's, Mescalito's... and then drive SLOWLY across the transversal (cross island road). They are ticketing people and the speed limit goes from 80 kph to 60 just before San Gervasio to 40... and they love rental cars! Have fun, its safe as hell, enjoy, and let me know how it all went! Cozumel- We rented a Harley and rode around the island with a guide. Adrian is a great guy and does SO much good for the island! We asked where everyone else was and he (they) said we were the only ones that signed up. I was a little skeptical at first but they could not have been nicer. My wife does not ride so she was with me. It was a 1200 Sportster. Stopped at some light houses and a restaurant. Told us some history of the area/island. Had a truck blocking intersections when in town for safety. It carried drinks etc. He was the camera man also. He would ride ahead and take photos in the more scenic areas. All and all it was very nice. Last edited by 240 LTS; 11-16-2015 at 04:41 AM. Glad you enjoyed it! It really isn't a pretty island, but the people make it beautiful. I look forward to getting back (in Vermont with my mom with terminal cancer...). I went through that with our Mom in 1998. Any Rec's for a jeep,rental at Porto Maya, Cozumel? You guys talked us into not doing a tour! No specific rec's on jeep rentals, just try to get one with a full top as rainy season seems to be continuing (4 inches last 24 hours!). Take a video of the entire jeep and look carefully at the light lenses and record any cracks - that seems to be their favorite "damage" charge. Have fun! The capital of the Cayman Islands on Grand Cayman, that is. Leaving tomorrow for Grand Cayman and Cozumel. Going with a group and we are doing sting ray city and then a jeep scavenger hunt in Cozumel. Will report back when we get home. Went there the first time on my honeymoon. Maybe it was an omen. 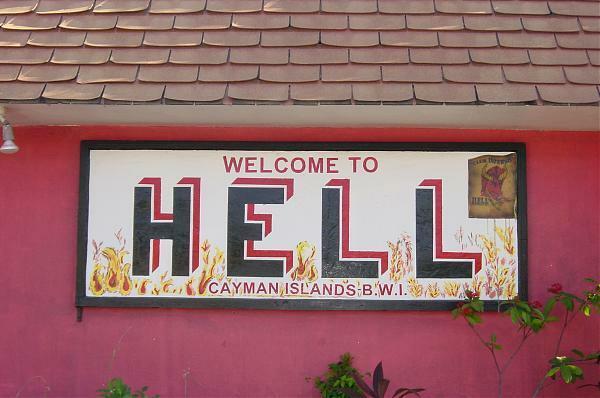 I'd second Hell, and be sure to send postcards from there to your friends/family is they will be postmarked from Hell. Short of that, I'd look into riding the submarine. That's really cool. Turtle farm is pretty fun too. As for Cozumel, if there was really anything to do there, I missed it... both times. We did GC and Cozumel on a cruise last Christmas. For Cozumel, we went to Paradise Beach. Nice beach for the kids to swim. Nice pool, decent service, good drinks, free Wi-Fi, OK food....everyone was happy. It's a 10 minute cab ride from the Cruise Ship terminal. Stopped in Guy Harvey's shop and gallery on GC. I was looking around and asked if he was in. The girl downstairs say, "Sure, he's upstairs". I went up and he was working on a painting. He said hello and we talked a bit. I had something on from O.C. MD and he asked about the White Marlin Open and said that's a great event. With that brief encounter he seemed like a very easy going approachable guy. On Cozumel we did the America's Cup race. It was a good time and they also served beer on the boat during the race.